Clean stone surfaces with a few drops of neutral cleaner, stone soap, or a mild liquid dishwashing detergent and warm water. Glass cleaner works well, but avoid glass cleaners that contain ammonia, such as regular Windex®. A good one to use that we have found is Glass Plus®. 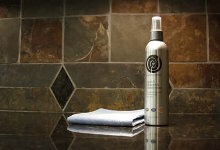 Most ammonia-free glass cleaners will state as such on the label. When we install every piece of stone we seal it with a sealer that will protect it for 1 year, and every stone should be resealed every 8-12 months.